The intercellular adhesion molecule (ICAM-1) is a surface glycoprotein typically expressed in low levels on epithelial cells. It is also stimulated with IL1 and TNF-α activation to express on immune cells. Furthermore, it is a binding site on respiratory epithelial cells for the human rhinovirus (common cold virus). ICAM-1 is known for stabilizing cell-cell interaction and leukocyte endothelial transmigration. Traditionally, fluorescently-labeled ICAM-1 can be qualitatively inspected via fluorescent microscopy or quantitatively measured by flow cytometry. However, the manual microscopy method is time-consuming and non-quantitative. Flow cytometry can generate highly sensitive quantitative results, but requires a highly-trained user for generating meaningful results. By using the Celigo imaging cytometer, antibody or fluorescent protein-labeled receptors can be imaged and the fluorescent intensities of the target cell populations are measured to determine the level of CD54 ICAM-1 expression automatically. 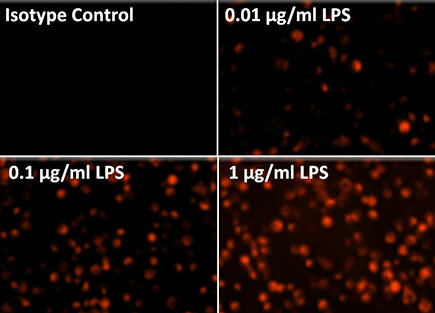 CD54-PE fluorescent image showed decreasing % of ICAM-1 expression on the cells as LPS concentration decreased. The total number of cells are counted using the Celigo captured bright field images, while the fluorescent images are counted to determine the number of cells expressing CD54 ICAM-1. The CD54 expression level is determined by the total fluorescent intensity in each tested sample. Cells stained with ICAM-1 CD54 Ab showed the decreasing fluorescent intensities as LPS concentration decreased. The Celigo imaging cytometer can be used to measure ICAM-1 CD54 expression via fluorescence detection. 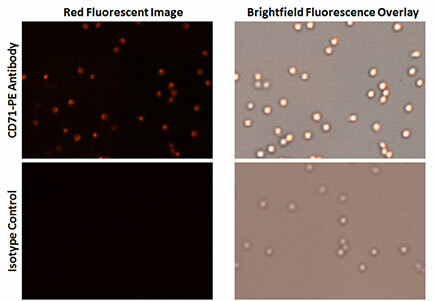 The ability to capture bright field and fluorescent images in a multi-well microplate automatically allows for high-throughput cell-based assays. In addition, analyzing adherent cells directly on the plate eliminates the need for trypsinization and removes the disruption to the cells. The transferrin in the blood is a glycoprotein that can transport iron to cells from the liver and intestine. Generally, the surface transferrin receptor on the cells can readily bind to the ferrotransferrin (transferrin bound with iron) at neutral pH, which then induces receptor-mediated endocytosis of the ferrotransferrin. The iron (Fe3+) ions are taken up inside the cells through the clathrin-coated vesicle into endosome, while the unbound form of apotransferrin is secreted back into the blood for reloading of iron. This pathway is an attractive delivery method for drugs, proteins and therapeutic genes into malignant cells with overexpressed transferrin receptors. Traditionally, fluorescently-labeled transferrin receptors can be qualitatively inspected via fluorescent microscopy or quantitatively measured by flow cytometry. However, manual microscopy method is time-consuming and non-quantitative and flow cytometry can generate sensitive quantitative results, but requires a highly-trained dedicated user. By using the Celigo imaging cytometer, antibody or fluorescent protein-labeled receptors can be imaged and the fluorescent intensities of the target cell populations are measured to determine the level of CD71 transferrin receptor expression automatically. CD71-PE fluorescent image showed showed high % of transferrin receptor expression on the cells in comparison to the isotype control. The total number of cells are counted using the Celigo-captured bright field images, while the fluorescent images are counted to determine the number of cells expressing CD71 Transferrin Receptor. Cells stained with specific transferrin receptor Ab showed the highest total fluorescent intensity signals in comparison to the isotype control, nonspecific Ab, and isotype control for nonspecific Ab. The Celigo imaging cytometer can be used to measure Transferrin Receptor expression via fluorescent detection.